Chris Gayle has become the first batsman to accumulate 10,000 Twenty20 runs, going past the milestone during a match-winning blitz in the Indian Premier League. Swashbuckling West Indian Gayle, 37, who plies his trade across the world's Twenty20 leagues, smashed 77 off 38 balls with five fours and seven sixes to lead Royal Challengers Bangalore to a 21-run win over Gujarat Lions in Rajkot on Tuesday. Gayle's nearest rival New Zealand's Brendon McCullum, who top scored for Gujarat with 72, has more than 7,500 runs in the shortest format. The self-proclaimed "Universe Boss" has scored 7,534 runs in fours and sixes in his domestic Twenty20 career including 18 centuries and 61 fifties. The burly left-hander from Jamaica thanked his fans on social media. "Big Thank You to the fans for the love and support over the years! Many more entertainment to come! 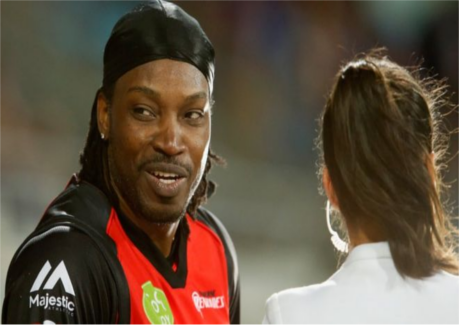 #10000CG #Champion #KingGayle," Gayle tweeted. Indian tycoon Vijay Mallya, who was arrested and later granted bail in London on Tuesday for alleged fraud, also congratulated Gayle on Twitter. Gayle replied with a "Thanks Big Boss" message for his team's former owner who stepped down from the post of franchise director last year. Gayle last played a Twenty20 international in April last year after an alleged pay dispute led to a fallout with the West Indies Cricket Board.